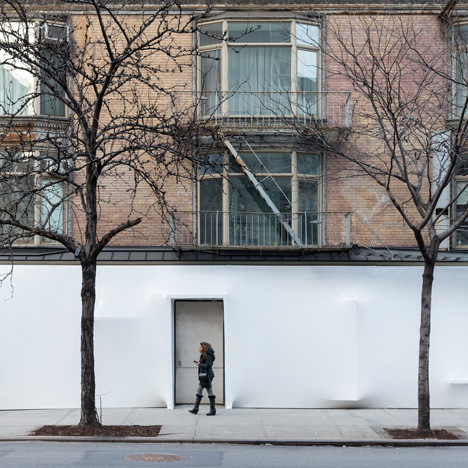 SO-IL "anticipated" Storefront graffiti but hoped for "better"
News: architecture studio SO-IL's installation for the New York architecture gallery has been vandalised within weeks of opening – but the firm's co-founder says he "knew" it would be a target for graffiti. The phrase "ugly kids" features in one of several tags created using black spray-paint across the immaculate white plastic film covering the facade of the Storefront for Art and Architecture gallery in Soho. The Blueprint installation was created by Brooklyn-based SO-IL as part of an exhibition curated with Dutch artist Sebastiaan Bremer, which opened on 23 January. Three weeks later, the gallery has posted an Instagram image showing it covered in graffiti. Speaking to Dezeen, Idenburg said he "anticipated" the attack, but expected the quality of vandalism to be "better." "We knew this would happen," Idenburg told Dezeen. "Unrestrained, Storefront pushes itself into the public domain. By wrapping it in a white canvas it further provokes a response from the city." "It was anticipated, but what a poor quality of the graffiti... We had hoped for something better," he added. 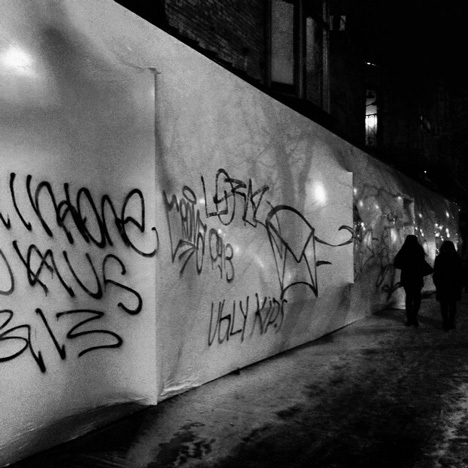 The work, which masks the gallery facade in a thin sheeting of white plastic, is now covered with scribbled outlines and letterings, including the tag that reads "Ugly kids". A follower on Storefront's Instagram page commented below an image of the soiled installation, "Big white canvas in Soho... tempting for any graffiti artist." Joining the conversation, Idenburg added, "There were days in NY that graffiti looked good, now its just #lame tags." Storefront for Art and Architecture was set up as a forum and platform for emerging architecture, art and design practices. The organisation's gallery space hosts a regular programme of exhibitions, artist's talks and film screenings. In response to the graffiti, the gallery will host a salon on urban violence on 27 February.